So this is the thing. Since Rodger’s acute observation on my Three in one plus one post that the three bikes had the same frame, I have magically become a frame expert. 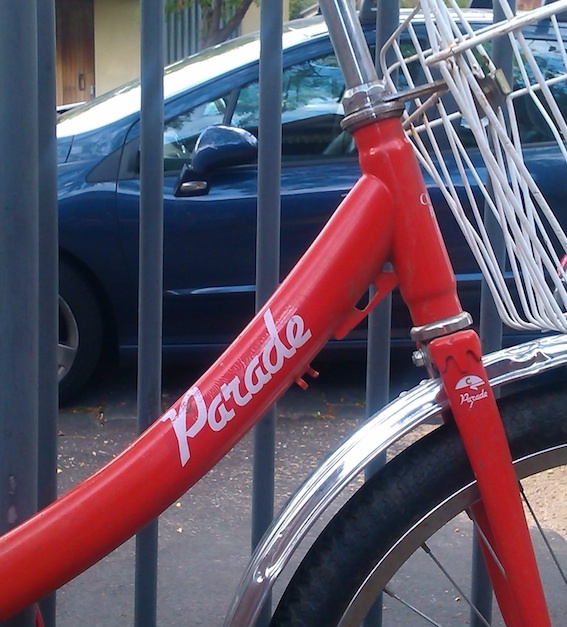 And my newly expert eyes tell me this North Fitzroy-residing Custom Built Parade has the same frame as a the Graecross, the Malvern Star and the made in Japan Centurian featured in said post. made in South Australia no less. I’m shocked. The bottom of my bike spotting world has fallen out. It’s like I just found out that the dude from the Sopranos wasn’t actually in the garbage collection business. Have I been photographing the same bike over and over? Has the small wheeled bike loving fraternity been sniggering at me behind my back all the time? Should I even bother to go on or is this the last calling card I leave? The answer to this and all those other questions will be revealed in the fullness of time (as opposed to the emptiness of time…which is probably a concept only Stephen Hawkins could wrap his head around)…stay tuned. 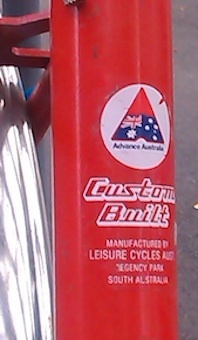 Leisure cycles S.A. must have been a big concern once, I find their stickers are on a lot of older bikes. Thanks for visiting my blog. 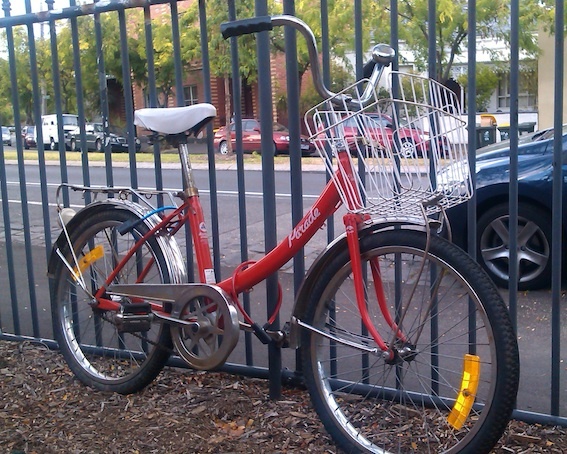 Your blog is full of beautiful bikes and making me want to buy a new (old) bike now! yep, they sure don’t make ’em like they used to…But wait! don’t you still have that Raleigh shopper? 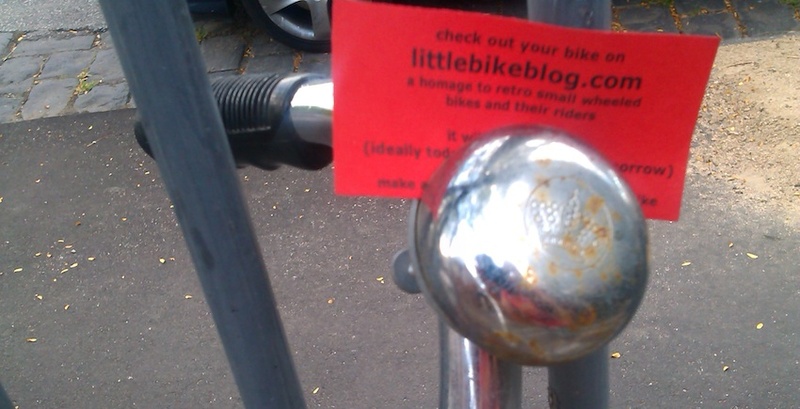 That’s how I stumbled upon your blog – (TRAGIC I know, trawling the net for mentions of shopper bikes…I should get out more). Please say you still have it. Yes, I still have it. There’s someone who really wants to buy it from me but although I don’t ride it much (my other bikes are a bit easier…), I can’t bear to part with it! oh that’s good. and yes they are adorable but hard going on the thighs compared to big wheels (not that I said that out loud) especially for those of us with a 4 in the beginning of our age. I mainly ride mine when I only have a short way to go, up to about 4 kilometres each way, which I like because apart from the pleasure of being on my very gorgeous upright green bike, I am getting more exercise per kilometre. I found your blog because I was rebuilding a Graecross 10-speed. Very cute, I like the calling card.